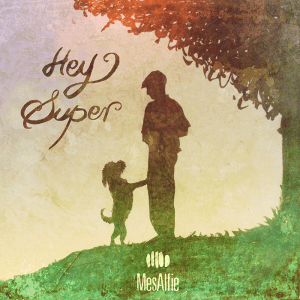 It’s hard to ignore MesAlfie’s old world charm when you listen to his newest release Hey Super. The singer/songwriter’s first English album drips with European influence whether it’s the lyrics, lush orchestration, or accordion backdrop, he could be heard on pop radio, or a cafe in the center of Rome. MesAlfie has had a previous career in Italy, with his band Aleph, which were popular in the 90s in Italy and around Europe. This time around, he took the moment to slow down at his family home in Italy, recording the album in relative comfort, and it shows. Hey Super has a depth to it, it’s heavy without being pretentious, and skips along the river at low velocity with great storytelling quality. Album opener “Dear Enemy” drives a solid drum beat with underlying piano, harmonies, with an immediate European-styled guitar paralleled with a similar string arrangement. “The Incredible World” slinks on a river bank looking at the stars glittering back at the listener, again with orchestration that puts you on MesAlfie’s compound in the middle of the night. Lead single “Must See New York” takes a different perspective on the love of the city from a tourist’s point of view. “I Need By” pushes MesAlfie’s voice during the chorus showcasing his baritone range. “I’m Gonna Meet You” is easily the album’s most rocking song with a guitar that will get you down the highway. This record is perfect for a nighttime fire, late nightcap with your friends, or a walk under the stars. The songs are well-crafted hymns to the world around MesAlfie. Musings from his childhood farm, and a record to put on when you need to come home.